Here’s another one on the market as Burgess tell me they’ve signed the 41m catamaran motor yacht Seafaris for sale in a joint listing with Simpson Marine in Hong Kong. 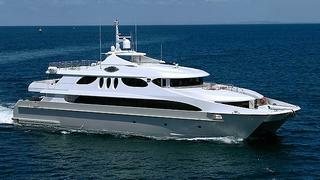 Custom built in 2006 by Australia’s Forgacs Shipyard, she was developed for shallow draft, fast cruising and luxurious yachting on the Great Barrier Reef. Seafaris offers spacious accommodation for 10 guests in five staterooms, all located on the main deck with the well-appointed owner’s suite lying forward with direct access to the open-air foredeck. Four double guest staterooms compare in size to those found on larger monohull yachts with the added benefit that two can be converted to twin cabins. Various interior and exterior spaces over three decks include a gymnasium, library, cinema area and hydrotherapy spa, also making Seafaris an ideal commercial / charter operation, with an already proven track record. The yacht has been well maintained by a diligent captain and crew and presents in impressive condition both technically and aesthetically, with a full repaint and interior upgrades completed in 2010. Seafaris is asking US$12.5 million.